Jasc Animation Shop is a powerful yet easy-to-use program that creates animations from one or more graphic images and offers a wide variety of effects and transitions for enhancing animations. Used as a standalone application Animation Shop allows users to easily create animations for use on a Web site or in a presentation. Animation Shop's straightforward interface allows anyone to create effective buttons, banners or other animated effects without a steep learning curve. Users can easily import multiple-layer images to automatically build animations or use the Animation or Banner wizards to assemble and create new animations. Animations can be quickly and easily modified using features like drag-and-drop editing, registration marks, automated cropping options, frame culling, flip and mirror frame adjustments, and a selection of painting and drawing tools. Once finished, animations can be optimised for the Web with the powerful Optimisation Wizard, which provides a comprehensive selection of file output options. 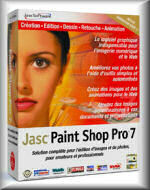 Jasc Paint Shop Pro 9 sets the standard for affordable, professional image editing. 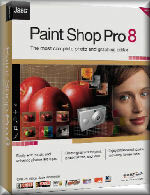 Version 9 builds on Paint Shop Pro's legacy of creative innovation with a new suite of art media features, professional photo editing tools, and precision graphic design capabilities to offer users limitless creativity. You can greatly reduce time spent on production tasks with Paint Shop Pro's streamlined production tools. Edit photos, create graphics, draw, paint, and animate, all within a highly customizable workspace environment. 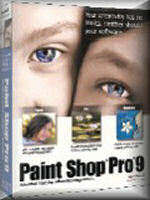 Paint Shop Pro 9 provides advanced tools for advanced imaginations. Discover the photo-editing software that gives passionate photographers more to love! This release extends the legendary photo-editing power of PaintShop Pro with 75 new and enhanced features based on the needs of real photographers like you. Create your best images yet with exciting new pro-level effects. Explore new tools that help you tap into the latest photography trends like HDR and tilt shift. Enjoy a streamlined workspace and dramatically faster tools that let you see results as you work. When you’re ready to show off your best photos, sharing online is just a click away. 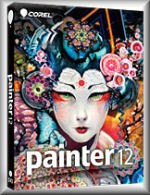 is the world’s leading digital art software. Designed for artists by artists, it opens up a world of creativity by offering progressive drawing tools, lifelike Natural-Media® brushes and the most realistic digital painting experience. With its impressive array of brushes, paper textures, paints, oils, watercolors and more, there are no limits to what you can create! And thanks to extensive file support, you can also build upon projects you've started in other programs, making Painter a great complement to Adobe® Photoshop®. Create your best photos ever with new Corel® PaintShop® Pro X6. Built with a powerful new 64-bit architecture, this complete photo-editing software offers more speed than ever before. Turn your snapshots into beautiful, gallery-worthy images with easy-to-use editing and design tools. A great fit for all skill levels, PaintShop Pro X6 brings out the best in your photos that matter.